Fall means it's officially pumpkin season, and that makes this girl happy dance. 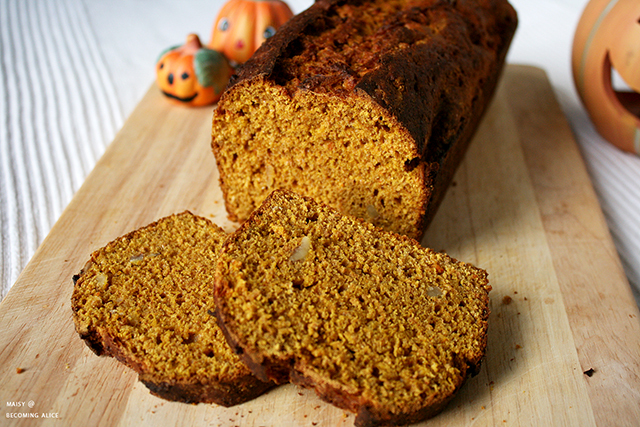 Carved pumpkins; pumpkin spice lattes; pumpkin pies; pumpkin soups; and, of course, pumpkin bread. I have to admit, this was my first time making pumpkin bread (I'm not American though, so I might be forgiven for this felony), but it turned out really nice. This recipe uses yeast, so you could say it's a German-American hybrid, lol. 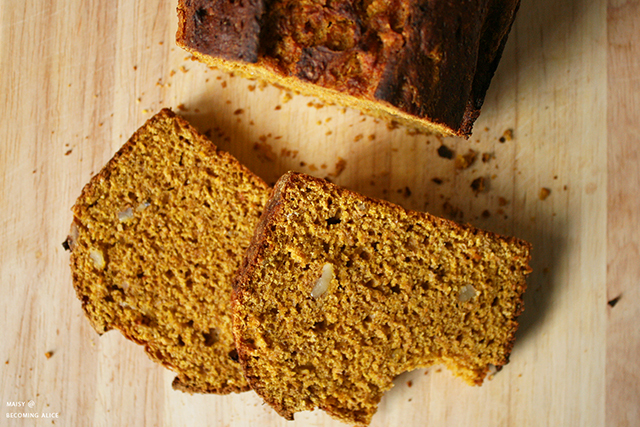 It's definitely a yummy recipe, and an easy one to make, too — just a bit of mixing and stirring, pop it in the oven, and, in about half an hour, you'll have a house smelling of sweet autumn spices and a scrumptious pumpkin loaf. Knead well, using a hand mixer or your clean hands. The batter should feel soft and slightly oily/moist. Cover the bowl with a clean kitchen towel and leave to rise in a warm place for 45 minutes. Read a book, watch a TV series, then return to your batter. It should have doubled in size by now, and already smell delicious. Preheat your oven to 180°C / 350°F. Drop the batter into a lightly greased loaf pan. Even it out. Bake for about 30 minutes or until the pumpkin bread looks golden brown and a toothpick from the centre comes out clean. - Add nuts of choice, dried fruit, cranberries or chocolate chips to the batter. - Top your bread with nuts, pumpkin seeds or chocolate chips. - For an oil-free version, replace the oil with 7 tbsp of pumpkin purée. - Use puréed butternut squash or sweet potato for variation. - I you don't have a loaf pan, cut the recipe in half and make a batch of pumpkin muffins instead. 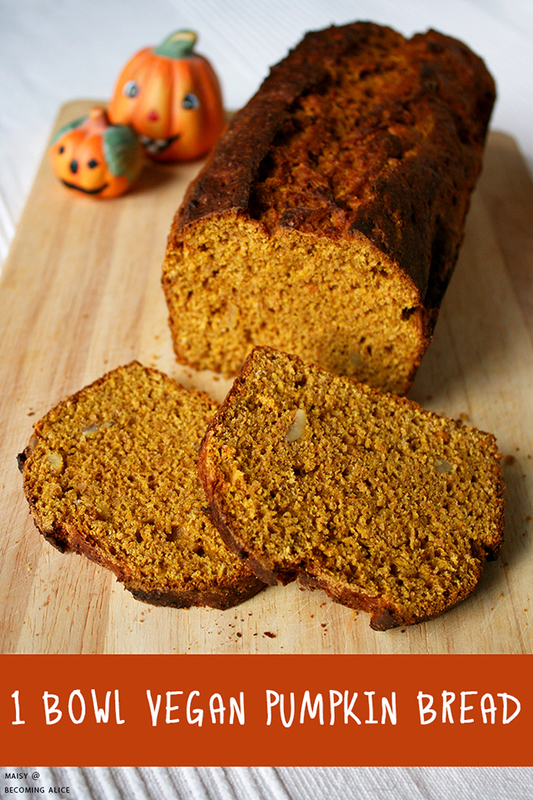 - For a moister pumpkin bread, use this banana bread recipe and replace the bananas with 2 1/2 - 3 cups pumpkin purée! 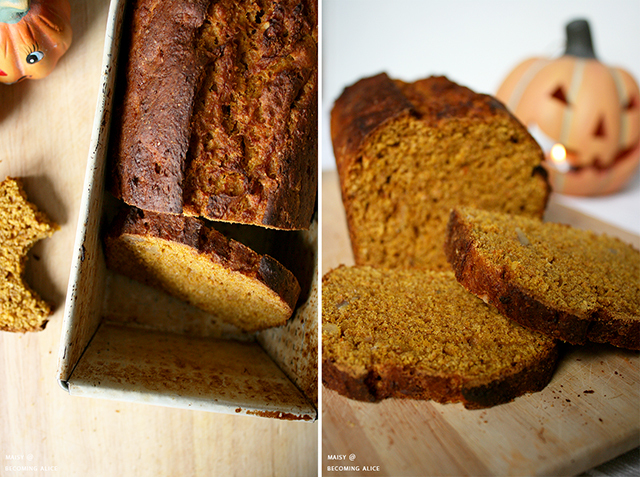 Since I'm all knew to this whole pumpkin bread business - how do you prepare yours? And what to serve with or on it? Let me know!